The Kinks, "Living on a Thin Line"
Bill Buford's Among the Thugs is the most remarkable book I have ever read. 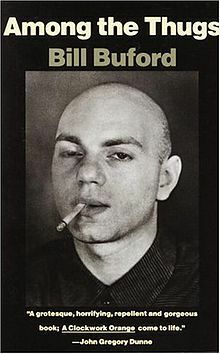 The front cover features a picture of one of these "thugs", a skinheaded English bloke half-lidded smoking a cigarette whose visage gives off the impression of a personality barely connected to the reality around him, yet who also gives the impression that he's about three seconds away from punching your nose into your brainstem. Below this face is the novelist John Gregory Dunne's very apt description of the experience of reading this book: "A grotesque, horrifying, repellant, and gorgeous book; A Clockwork Orange come to life." Thugs marks a moment in time, but like any moment in time, that moment's tentacles connect irrevocably to our present moment and how our present moment is warped by our preoccupations of the past and our fears and hopes for the future. Among the Thugs is Buford's deep dive as an American journalist into the horrifying and fascinating phenomenon of English football hooliganism. David Rudin, in his review of Thugs in Howler Magazine, marking the 25th anniversary of the book's publication, writes that "Buford's account of the thugs he moved with are by turns amazing, repugnant, stunning, horrid, and exhilarating. In the same way the 'crowd violence was their drug,' Buford's account gave me a fix. The same passages turn me on and make me want to turn away." I'm not sure what it says about me that I'm now into my third reading of this hell-scape tome. But there is a tremendous relevance to Thugs in our present moment. The phenomenon of football hooliganism does indeed seem, at least at the highest echelons of European football, to be a gruesome relic of the past. For those of us, so many of us, who have been part of the great emergence of football in America over the last couple of years, we are learning so much, being exposed finally to the greatest sport the human being has produced. We are experiencing fully, finally, since now the "beautiful game" is all over our tele's and streams, the religious experience of being a football fan. Hooliganism never enters into our vision in the slick, mannered, utterly professional and global presentation of the Premier League. So many of us learn about the mechanics and intricacies of football by playing FIFA and Football Manager and never even think about the hooligans and thugs who once threatened the very emergence of football which now blesses us. Yet the thug on the cover of Thugs has not completely disappeared. Yes, the corporatization and globalization of the game have moved us far away from the disasters at Heysel Stadium in 1985 and the stampede/crush at Hillsborough in 1989 (ESPN's 30 for 30 doc Hillsborough is essential viewing to understand this moment in time -- there are images you must see but that you never want to see again). But the menace of violence surrounding the game of football remains present like a nasty ghost. The violence at this summer's UEFA Championship tournament in France was intense enough that the English and Russian national teams were threatened with expulsion. What is even more pertinent to Thugs' ongoing relevance was the recent Brexit. As Buford makes clear throughout the book, the phenomenon of the thug was/is rooted in people who feel unmoored, discarded, and disconnected from the splendors and wonders of the corporatization and globalization of society. "The rest of the world is a big place, and its essential inhabitant is the stranger. The supporters did not like the stranger... And there was no stranger more strange, and therefore no stranger more detestable, than the foreigner... The problem with foreigners was this: they were incomplete... foreigners had never quite climbed all the way up the evolutionary ladder; there was a little less of the foreigner, especially foreigners of a dark complexion..."
Watching videos coming out of the UK since the Brexit, videos in which modern-day thugs berate people of color on public buses, telling them to "get back to Africa! ", hearing that hate crimes have surged 42% in England and Wales since the Brexit, understanding that a "frenzy of hatred" not only fueled the Brexit but is being fueled by the Brexit, we watch the visage of the thug on the cover of Thugs step out and come alive again. We must understand the thug if we are to understand the complexity of the rise of far-right/neo-fascist populism in Europe and in America. To understand the thug we have to attempt to do what Buford did: to enter into the world of the thug, the everyday life of the thug, to even have compassion for the thug and to hear his grievances at being left behind by forces beyond his control, forces which can be considered the real enemy. Among the Thugs is also a deeply religious book, for it reveals to us what happens when devotion becomes the motivation and mechanism of violence. Devotion curdling into violence is a virus which continues to infect our bodies of faith. With this understanding of Thugs ongoing and increased relevance for our social body infected by the presence of visceral, murderous hatred, we will explore, through a series of upcoming blogs, how Thugs helps us to understand why, when, and how devotion becomes violence.